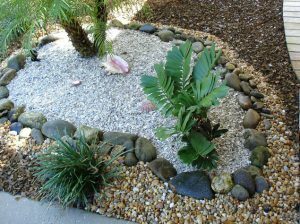 If there is already existing mulch or stone where shell is intended to go, remove the mulch or stone first. When installing material in an area where furniture is to be placed, such as a patio area, it is important to make sure the surface of the area is level before and after installation of the product. With exception of 50/50 mix, always wash shell after installation. Sometimes a few good rinses are needed. 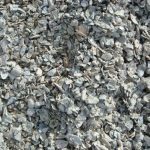 Though the most common use for crushed shell is pave a pathway through your garden, mulching with crushed shell provides the plants with much needed calcium and minerals as the shells themselves decay. This will save money on soil additives over time and for those who are concerned with Green Living, you will have avoided the chemically processed additives completely. White and gray in color. Mainly 2” in size. Just like shells on the beach. Commonly used for driving and parking areas. Can be installed and used in many applications including landscape beds, patio areas, around pools. Sold by the yard. It’s a must have for tropical landscaping. Easy to install and incorporate to any landscaping. All natural and organic material. 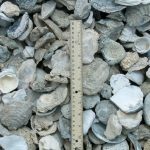 Also known as small/crushed shell, is made up of tiny bits of shell up to quarter size or ¾” of an inch and smaller, white and gray in color. Commonly used for driving and parking areas. Can be installed and used in many applications including landscape beds, patio areas, around pools, and ideal for walk ways and paths. Sold by the yard. It’s a must have for tropical landscaping. Easy to install and incorporate to any landscaping. All natural and organic material.